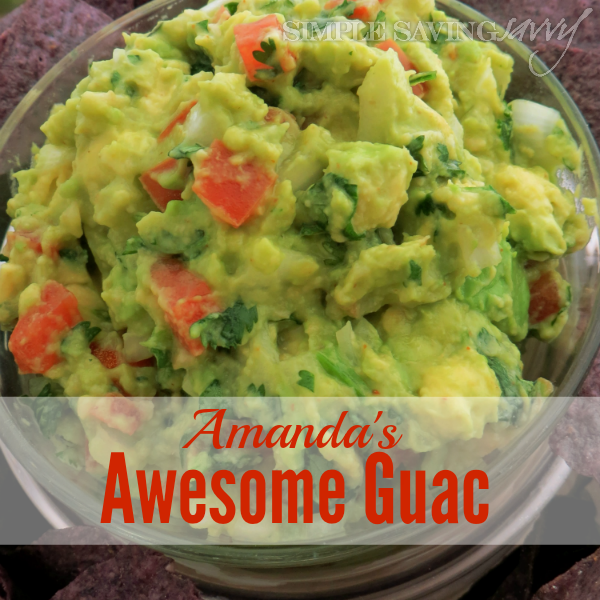 If I had a dollar for every guacamole recipe I’ve tried…..
That reminds me…my husband has a pet peeve. Every time I say “gwaka molee” instead of “waka molé”, he quickly corrects me. So I say it the wrong way all the time just to mess with him. Trust me, he has more than earned my orneriness, but this post is not about that…it’s about gwaka molee….. Although guacamole originated with the Aztecs in Mexico, over the years it has become an American staple. We serve it as a dip for chips, layer it on burgers as a condiment and even toss it into salads. Traditional guacamole recipes call for simply mashing ripe avocados together with sea salt and a little lemon juice. Trendier recipes take things up a notch by throwing ingredients like tomato, onion, cilantro, yogurt, jalapeno (and others) into the mix. That’s what I’ve done with Amanda’s Awesome Guac. My guacamole recipe uses fresh, mouthwatering ingredients and features a chunky texture that creates little, surprising bursts of flavor in your mouth. Guacamole is a popular offering at that big football game that happens in February (what’s it called again? *wink*) and Cinco de Mayo get togethers. We used to see the best prices on avocados in the summer, but thanks to year round crops, you can pick them up cheap all year long! I like to make my guacamole the day before serving so that the flavors have time to mingle. Like many other recipes, it’s always best the second day. There’s only one problem and that’s that the avocado will turn brown very quickly, like bananas or apples. To preserve the fresh green color of my guacamole, don’t mix the lime juice in at first. Instead, mix all the ingredients together as directed and press down into an airtight container, making sure to get rid of any air bubbles. Then squeeze the lime over the top of the mixture and move the container around so the juice spreads over the entire surface of the guacamole. When you’re ready to serve, simply stir the lime juice in and voila! Place avocado in a medium bowl. Using a sharp knife, slice it into chunks. ingredients, being careful not to over mix. Press mixture into airtight container and press out air bubbles. Pour the lime juice over the top and move container around to spread juice over entire surface. Refrigerate overnight to combine flavors. Stir in lime juice and serve.